Sarasota Dentistry creates beautiful custom dentures for our patients. Dr. Michael and his team of dental experts are helping patients with their dentures. Full dentures are removable devices that are designed to replace a full arch of missing teeth on the upper or lower jaw. Dentures are acrylic-based devices that fit over your gum tissue to provide you with a functional chewing surface and teeth to smile with. Dentures may never feel quite like your natural teeth, but are more comfortable and realistic looking thanks to today’s dental technology. There are both upper and lower dentures. 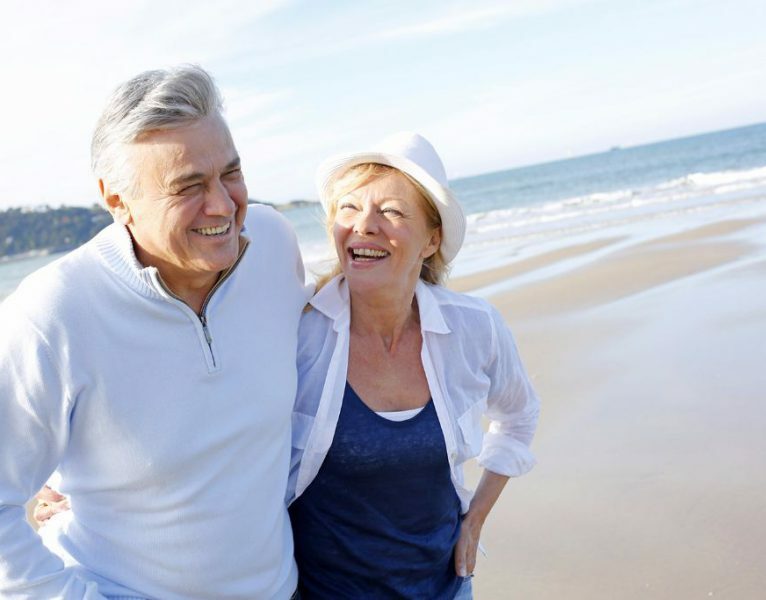 Sarasota Dentistry is ready to help you find the best dentures for your needs. Upper dentures are held by the suction created by the acrylic base of the denture as it is placed over the roof of your mouth. In most cases, this suction is more than sufficient to hold your denture and allow you to function normally with it. Lower dentures are horseshoe-shaped to allow space for your tongue, and designed to fit specifically to the contours of your lower jaw. They don’t use suction like upper dentures, but are effective as a removable replacement of missing teeth. The cost of dentures can vary greatly depending on quality, fitting, location, insurance and your dentist. There are many cheap options but generally the lower cost options are poor fitting, low quality and lacking in follow up support by the treating dentist. The average cost of both upper and lower dentures can range from as little as $1,000 up to $8,000 and more. The final cost depends on several details. For instance, if you want or need immediate dentures to be placed in your mouth the same day as your teeth are extracted, the cost ranges from $1000 to $5,000 per arch plus the cost of dental extractions, bone grafting and any other necessary work. In many cases, patients are only going to wear the dentures while the jaw bone heals for dental implants and a permanent implant retained bridge. Other factors can affect the cost for a partial or full set of dentures including the fees charged by the dentist, the location in which you purchase your dentures, the type of dentures you choose, and the quality of the materials used in making your new set of teeth. Most health or dental insurance plans cover a portion of dentures – dental plans average between $1000 to $2000 in benefits per year. You should verify benefits directly with your dental insurance provider. Low cost dentures run about $1,000 to $2000 for the full set. These dentures are cold-cured and usually do not look as natural, are susceptible to fracture, and can irritate the skin. Mid-priced dentures run about $2,000 to $5,000 for a complete set. They are heat-cured, injection molded, and typically look more natural and last longer than cool-cured dentures. Top-quality dentures are premium heat-cured and will cost approximately $2,000 to $4,000 per denture, or about $4,000 to $8,000 or more for a complete set. These dentures can be customized based on the preferences of the person purchasing them. Dentures should last at least five years and most last eight to 10 years and in some cases, many more years. Annual check-ups with your dentist are imperative for cancer screenings and the overall health of your mouth. At these appointments, your dentist will also check the wear of your dentures to ensure they will continue to fit as well as possible to decrease the potential for sores or infections to develop in your mouth. Taking proper care of your dentures is important to ensure they last longer but they will still need to be replaced every eight to 10 years due to significant wear and deterioration over time. You will also need a reline every 2-3 years to keep the dentures fitting properly. Failure to perform relines of your dentures can result in loose fitting dentures that may fall out during speech or chewing. Loose fitting dentures also cause more rapid bone loss of the dental ridge which supports the denture. Dentures should be removed during sleep to help reduce the bone loss caused from wearing dentures. Dentures are an investment of time and money but more importantly, in your self-confidence. You will want to take proper care of them so they continue to look good and don’t need to be replaced as quickly. Most dentures will last at least five to 10 years. You should always remove and rinse dentures after eating. Simply run water over the dentures to remove food particles. You should always place a towel in the sink or on the counter so if your dentures slip from your hands they won’t break. You should clean your mouth after removing your denture with a soft-bristled toothbrush, including your gums and tongue. Not only will this remove food particles but it will remove any adhesive you may have used to hold your dentures in place. Dentures should be removed and cleaned at least once a day. Many people opt to soak them in a cleaning solution specifically made for dentures overnight while they sleep. After soaking, dentures should be cleaned with a denture brush to remove any food particles and to rid them of the cleaning solution before you put them back in your mouth. The amount of time it takes to get dentures depends on if you opt for immediate dentures or not. If you do, the entire process, including the extractions of your teeth, only takes three to six weeks. With immediate dentures, you get your new teeth on the same day your teeth are extracted but will need to have your dentures relined at least once after the first six months to one year after receiving your dentures. Immediate dentures require dental molds to be fabricated prior to fabricating the immediate denture. It generally takes about two weeks to get the immediate denture back from the lab. Some denture clinics have an onsite dental lab and offer same day denture services. While these may sound very convenient, the quality may be compromised. Many dentists want patients to wait three to six months before they receive their final dentures, especially if the dentures are being custom-made for the patient. The gums in your mouth will change significantly in the first six months after your teeth are extracted due to the decrease in swelling and bone loss that occurs after teeth are removed. This time period ensures that your dentures fit properly and will not need to be adjusted as often. Whether your choose immediate dentures or customized ones, you will have at least four appointments with your dental provider to complete the process and possibly more visits if you receive immediate dentures since they will need at least one reline completed. Also, be prepared for 2-3 adjustment appointments to relieve sore spots that develop following the introduction of a new denture to the mouth. Do dentures require any kind of maintenance? Yes, one special kind of maintenance is called a denture relining. After a certain amount of time every denture will require a reline. It is recommended that you visit your dentist once yearly to evaluate the fit of your denture. After your teeth are extracted your bone will begin to shrink over several years. Your upper or lower jaw bone will begin to change shape over several years at a time, requiring a denture reline. Relining a denture involves taking a new impression of your existing upper or lower jaw and using that impression to place a new base into your denture. By relining your denture, you make it fit properly again. How do I know if I need a denture reline? How does denture relining work? There are two types of relines: hard and soft. Hard relines are more common because they are longer lasting. They are done by taking an impression of your jaw bone with your existing denture. The denture and impression are then sent out to a specialized laboratory, located in Sarasota, FL, to reline your existing denture with a new base that will fit properly to your existing jaw bone. This is a day long procedure, so you will be without your denture for approximately 4-8 hours. We take the impression in the morning, send it to the laboratory, and usually have it back by the afternoon. What is a soft reline? A soft reline is done in-office, but is mainly reserved for instances where implants are placed and healing must take place over several months - a temporary solution. To perform a soft reline a putty material is placed into your existing denture and placed onto your palate or jaw bone to create a new lining that fits properly to your mouth. Once the putty material is done setting, you will have a new, properly fitting base for your denture. The soft reline material provides a cushion for the implants while your jaw bone is in the process of healing. Soft relines are temporary. They are nearly impossible to keep clean without causing damage to the fit and they harbor bacteria over time. Which type of denture relining is appropriate for me? Dr. Michael prefers to do hard relines, because they are of better quality and longer lasting. Soft relines are hard to clean properly and fall apart much faster. Hard relines essentially replace the ill-fitting base of your existing denture with a new, properly fitting hard base. It is recommended that you visit your dentist office at least once yearly to evaluate the fit of your denture, and that you have your denture hard-relined every 3-5 years.